Campsite Le Nid d'Été is a campsite with 100 touring pitches and 67 year round pitches. 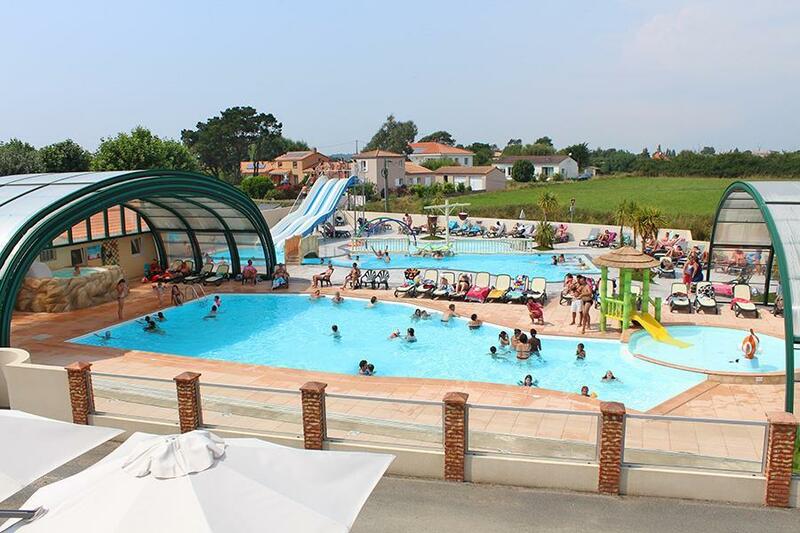 During low season, between 01-04-2019 - 14-07-2019 and 01-09-2019 - 29-09-2019, the nightly rate is €18,- at one of the 100 touring pitches at Campsite Le Nid d'Été in Olonne-sur-Mer (Vendée). At this campsite you can not only use your CampingCard ACSI for inexpensive camping, you can also use your ACSI Club ID (as an alternative ID). This family campsite is a great place to stay in the early and late seasons, just 3 km from a lovely sandy beach. The swimming pool is open from the beginning of April. There is excellent cycling in the delightful area. We spent a week here in July. we were given a pitch in the newer part of the campground, where the pitches were mostly very large and grassy. When booking, we had requested a pitch with some shade but our pitch had none. The sanitary block in this area was totally unsuitable at this time of year when the site is almost full - one toilet, one washroom, one shower and one disabled combination room. Toilet paper was provided, except when the dispensers jammed or ran out - most days - so frustrating. The wash-up sinks round the back could have done with a light for those clearing up after dark. The pitches were a mixture of chalets and tents/caravans/motorhomes. The pool complex was fine - indoor pools had warm water but the outside pools had very cold water. The children pool was good but too easy for little ones to gravitate into the main pool. The childrens' playgrounds were adequate - perhaps a bit tired. Overall, we felt that the staff, equipment and services at Le Nid were stretched too far at this busy time of year. You have to ask for a map of the area - they keep them round the back! Would you like to book Campsite Le Nid d'Été or request more information? You can do both using the information below or by visiting the campsite's website. From Angers follow the A87 as far as La Roche-sur-Yon. Then take the Les Sables d'Olonne route. Follow the signs in Olonne-sur-Mer. CampingCard ACSI will send your information request to "Campsite Le Nid d'Été".